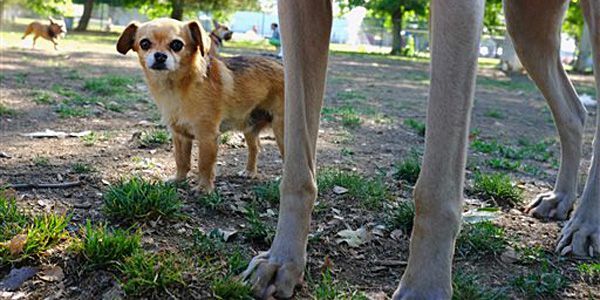 The smallest dogs in the world weigh less than 7 pounds. They can easily slip through cracks in a fence. Or they can get stepped on. Or they can get hugged a little too hard. A few other "little" problems are common in the popular "toy" pooches. People love to tote these dogs in purses, push them in strollers or carry them along on errands. Little dogs can be expensive. The can't keep up with big dogs on long walks. They shouldn't play roughly with kids. But pet owners say the small problems don't overshadow the little dogs' big personalities. "You have to protect them," said Debra Beilstein. She's the secretary of the Yorkshire Terrier Club of Los Angeles. Her Yorkie, 13-year-old Mica, weighs 3.8 pounds. She says their size doesn't keep them down. "Yorkies don't think of themselves as small," Beilstein said. "They have big personalities, lots of attitude." The Chihuahua, Pomeranian, Yorkshire terrier and Maltese are American Kennel Club-designated toy dogs. All weigh under 7 pounds. The Yorkshire terrier is the most popular toy breed in the country. It ranks No. 6 on this year's list of breeds. Small dogs like Yorkies still require big-time care, American Kennel Club spokeswoman Jessica Rice D'Amato said. "Just because they are small doesn't mean they need less exercise or mental stimulation," she said. And because the small dogs are so adorable, children tend to squeeze them like they do teddy bears. This can cause injuries, Beilstein said. Despite the risks and problems of pocket-size pooches, they can give big-time performances. 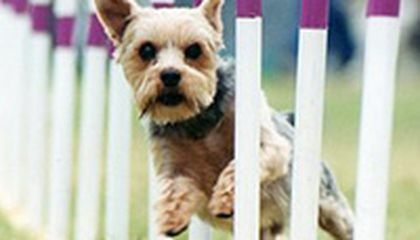 Pam Shelby, a retired teacher from Beaumont, California, said her Yorkie, Desi, became a champion in agility contests. There's nothing like taking your dog through the hurdling, jumping, climbing and swerving paces of the obstacle-laden contests, she said. Watch this rock-climbing bear cub! My sister has one of this dogs and you almost always step on her. Shes so small. Its hard not to step on her. She always gets out of the gate so we have to keep her on a leash. this is a very good story. why are yorkies so small? That is asome how they go through fence and how small they are. It is adorable and beautiful and sad and a nice dog.